Cancer is a twisted, horrible disease. The fact that there are multiple forms of cancer, each specialized to target a different part of your body, is beyond-words-awful. You’d think with as technically savvy as we all are, with the inventions we’ve created (see: iPhone) – we could have at least by now come a little bit closer to curing the damn thing. There’s no particular form of cancer that I can really say that I hate more than others. My paternal grandfather died of cancer when I was 13. I can’t remember what kind he had, but it was some sort of whole-body lymphoma, or something, I don’t know. I was only 13, I didn’t really understand these things. Only that Cancer was Bad and that my grandfather – who had surived the bombing of Pearl Harbor, WWII, triple-bipass surgery, a bad car accident, and raising seven kids – wasn’t going to be able to beat this one. I saw him the night before (of?) his death – I didn’t know what to say. I felt awkward (as all thirteen year olds do, I’m sure, anyway) faced with the imminent probability of death, and with all my aunts and my dad watching me… I meekly greeted him and sat there for a while until I had reached an appropriate time length. Being older now, I would have done things differently. I would have talked to him, told him how much he meant to me, said I love you… I did none of these things. I was a scared and uncertain tweenager and death was something I’d never had to deal with before. That, and my family was never really that emotional or expressive, so it just wasn’t something I was accustomed to. After his death, there was more hugging and more I-love-yous and less taking-for-grantedness. As it stands, I’m probably genetically predisposed to all sorts of cancer. That, and I’m sure I’m getting radiation posioning from the microwaves and cell phones and bluetooths and all the other dangerous technology. Everything causes cancer nowadays. Lots of causes… no cures. I’d attempted a Relay for Life event while I was in college. It was the same night as an all-day music concertfest that I’d helped plan/run so by the time I got there, I was exhausted. I did a few laps now and then, but mostly I think I just curled up and slept in the middle of our rec center. One of the sub-companies of the company I work for (dubbed SignifyPink as a spinoff of our apparel/promotions company Signify) has started a line of breast cancer fundraising and awareness gear called “Fight Like a Girl” – and I loved it from the first day I saw it. It’s sassy and it instantly solidifies all the females who see it. We all know what it’s for. It started when a hospital in Waterloo, Iowa, was testing their new mammography equipment on one of their employees. And they found breast cancer. They approached our company to produce a line of Fight Like a Girl shirts to sell to raise money for this woman… once they reached $20K, she said that that was all she needed – but she wanted us to continue with the shirts and help out other women. To date, I don’t even know how many women and hospitals we’ve helped out with this program. (If you’re interested in purchasing any of our awesomesauce Fight Like a Girl swag, go here). Which is a roundabout way of saying that, when they emailed our entire company to see if anyone wanted to be on the Fight Like a Girl team for the Des Moines Susan G. Komen Race for the Cure, I immediately knew that that was something I wanted to do. And, lest you make any assumptions, no, I do not run. I jog, at best, and even then, for short spurts and at a really pathetic pace. But I could walk. Crawling out of bed before it was even light out (and I am NOT a morning person, but it’s a small sacrifice to make), we carpooled to the capitol city of Iowa where we met up with a record-breaking turnout crowd, got some freebies, and set off. 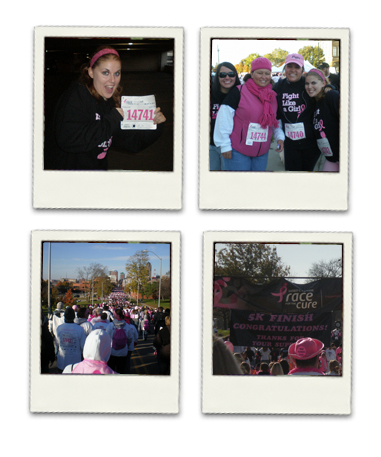 It had been rather chilly up to that point (a tropical heatwave compared to the January temps we are currently experiencing, ouch), but it was a beautiful fall day, and we completed our 5K with hundreds of thousands of other cancer-fighters. I’ve never done a 5K before, and towards the end, it was a little harder than I assumed it would be, but we did it! And I’m so proud of us. I only hope that it can help.